Door to Door Organics and $50 giveaway! 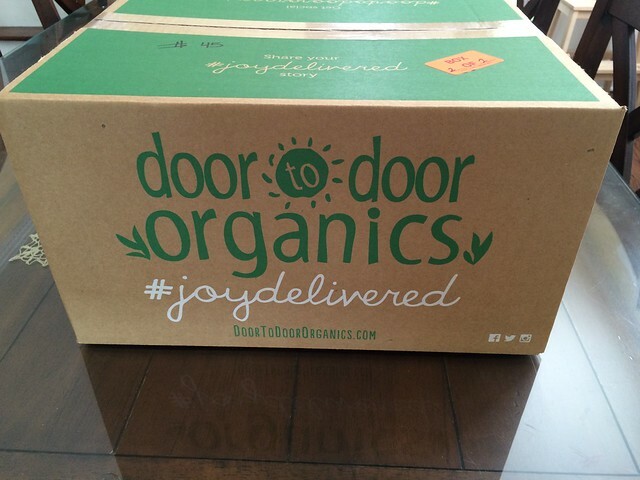 Here’s the low down… Door to Door Organics reached out to me to see what I thought of their service and share the results with my readers. Being totally transparent, they gave me a $100 worth of groceries good towards anything offered on their website. I almost fell over in shock. Me? FREE ORGANIC FOOD? In. Want to enter the $50 Free Food Giveaway? Scroll to the end for details. 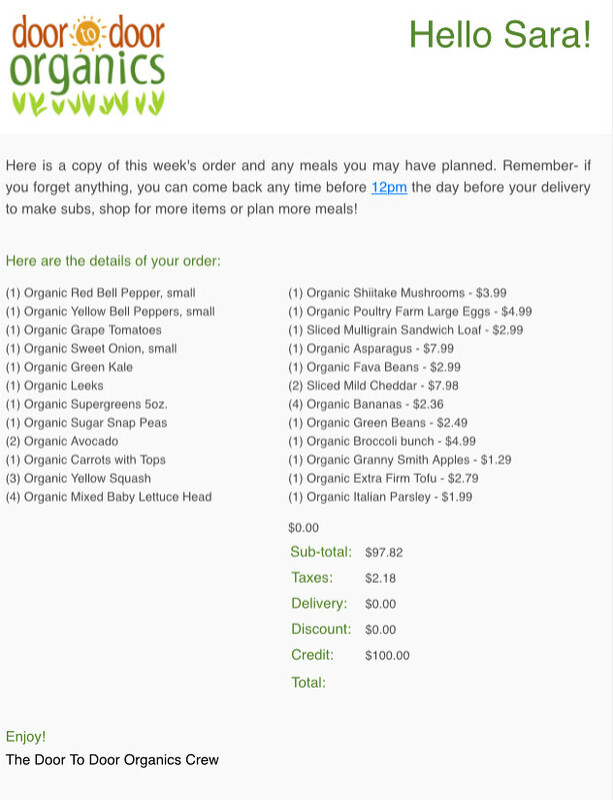 The short of it, they are an online grocery service focusing solely on organic food. Delivery is free, which, in my case sounds worth it right there to not have to shop with 2 kids on the days I need food but everyone woke up on the wrong side of the crib. However, the grocery store has always been full of teachable moments on the days we aren’t in a rush…So the jury is still out on whether I’m willing to trade based on convenience alone. All the produce, which if you glance at my receipt was the majority of my order, was gorgeous. It was a total relief since I was majorly skeptical of someone else picking out my produce. Truth be told, my husband has the best intentions and is amazing for making the trip from time to time, but I know he’ll always buy a rotten onion. Clearly Door to Door Organics is not selling bunk produce that fell off the back of the truck and they also have a great policy for returns should you need to use it. They also have a blog post about how to stick to a budget and shop affordably with them. However, I did not use this as a reference point since I am already in a buying rhythm week to week. My list always includes broccoli, avocados, kale, carrots, salmon, sprouted grain bread, and I always meal plan ahead of time. I was able to do a bit of price comparison and feel that sometimes I did better at whole foods and sometimes Door to Door was the less expensive option. Ugh. It was not hands down a winner in one court. For example, cheese slices. I always buy the Whole Foods brand Kosher Cheddar slices (hormone and antibiotic free dairy) that is 12oz at $5.99. This week in sticking to Door to Door I bought their Andrew & Everett mild cheddar slices that was only 7oz for $3.99. I bought 2 knowing we really blow through the usual 12oz. So I spent $7.98 instead of $5.99 and got 2 extra ounces. If I was going to be loyal to Andrew & Everett, Door to Door was CHEAPER. Same product is exactly $2 more at Whole Foods. Another example, organic green beans. Whole Foods sells them $2.97lb and DTD is sold only in 1/2lb bags at $2.49. Totals $4.98 if you go for a pound. Whole Foods is clearly the winner here. Same on shiitake mushrooms. It’s 10 cents cheaper a pound at Whole Foods. A cool seasonal product was in stock at Door to Door Organics- fava beans. Whole Foods doesn’t even sell them organic at either store near my house (Sauganash and Park Ridge). Nor could I find at Whole Foods organic rhubarb or Organic Girl supergreens pack (baby tat soi, baby chard, arugula, spinach). No problem for Door to Door Organics though! Organic Girl is even grown in Chicago!! The only way to guarantee your produce is from a local farmer on DTD is to sign up to receive the Local Farm Box. Unfortunately this is not offered year round and you have to get on the mailing list early and asap. If you don’t give a hooey who or where your organics are coming from then you’ll be delighted with Door to Door Organics. If you are picky like me, this will continue to weigh in with how you shop. 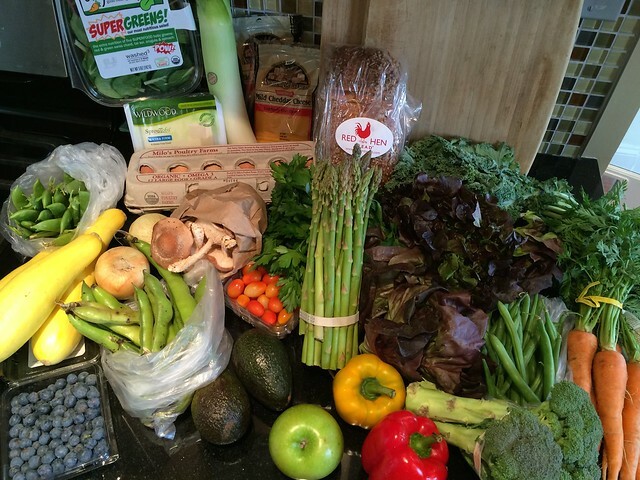 Shopping online with Door to Door Organics was easy and delightful. It’s a pretty website that makes you want to eat fresh food. They cater to all diets and provide quality meats, fish, dairy, and bakery items. Also, often from local purveyors such as Red Hen Bread, Organic Girl, FarmedHere, and This Old Farm. 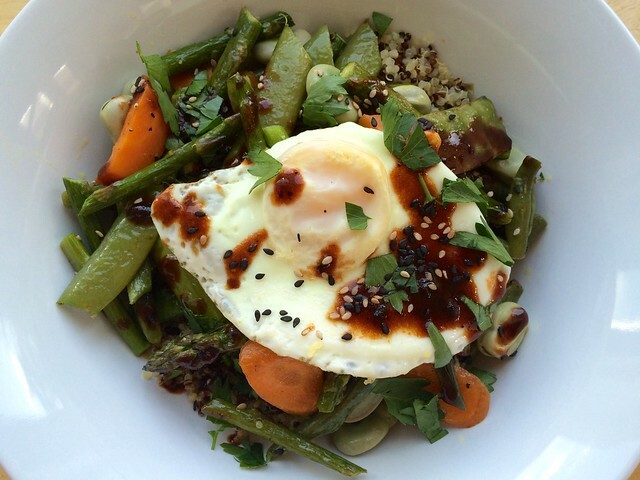 You can easily navigate to buying what is in season or stock up on pantry items as well. My favorite feature is that I could keep adding items or alter my list up to 12pm the day before my delivery. No more driving back to the store to get the one thing I forgot! -every packaged good on the website is clearly labeled vegan, kosher, gluten free, etc. Want to try Door to Door Organics yourself? YOU can get $10 off your first order by typing abalancedpractice into the coupon line! Anytime. No expiration. -Bring a friend to class and receive a raffle ticket. -Your friend gets a raffle ticket too. -You can repeat by coming to multiple classes with a friend. -The friend does NOT have to be new to me or the studio. -Winner will be announced June 1st!